Lots of things came to mind when I sat down to write about James Dashner's The Maze Runner. How books can be good, but not great. How books can have some annoying, bad elements to them, but not be horrible. Phrases like “damning with faint praise” and “mediocre at best” kept pressing my brain. I am completely in the middle of the road here. Forgive me. 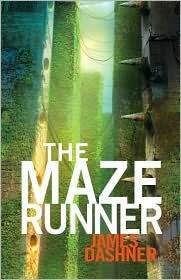 The Maze Runner is about Thomas, a young man who wakes up in an elevator going up and has no other memory ? save knowing his name. Thomas ends up in The Glade with a bunch of other young men and boys. The boys live in The Glade, making the most of it, and trying to solve The Maze. When Thomas arrives the general routine of The Glade changes and not for the good. The story smacks of Lord of the Flies meets “The Truman Show.” I know, I know. . . I'm comparing movies with books here ? silly me. But you get the idea. The Glade is in the center of The Maze ? as far as The Gladers (their name, not mine) can tell. Every night big doors close-off The Glade keeping the boys safe. The Maze holds dangers at night. Dangers like big blobby creatures with needles and pinchers and whirling noises, etc. No one has ever solved The Maze, no one has gotten out. The Gladers have been trying for years. Years. Then Thomas comes along and believes he holds the answer to solving the puzzle. Even though he can't remember anything before coming up in the elevator, he knows he's the key. The Maze Runner seems to take a long time getting going. There is nothing at stake for Thomas, or any of the other Gladers. There isn't a lot propelling the story forward except the passing of time. The doors close at night and as long as you make it back inside the walls before the doors shut, no problem. There is no urgency in the first part of the novel. It's a lot of day-to-day meanderings and you get to know some minor characters, but there is no urgency. All of The Gladers have had the same memory-wipe as Thomas, which evens the playing field for the 'game' of The Maze, but doesn't do much for character development. There is also no emotional center. Thomas befriends a goofy kid named Chuck, and they bond. But again, nothing other than the proximity of The Glade holds them together. I was also moderately distracted by the slang/swear alternates. I get that you don't want a lot of F-bombs dropping in YA novels. But Mr. Dashner puts some quirky non-swears on just about every page, and it got annoying. (I remember seeing “Fantastic Mr. Fox,” and instead of swearing they just said the word “cuss.” Are you cussing with me? This is one big cluster-cuss. I sure as cuss hope so! But I felt it didn't distract from what the character was saying, it added to the humor and tone of the story.) Mr. Dashner uses klunk, shank, slint, and shuck interchangeably and I always found it distracting. As a reader, I feel that one of the previous mentioned non-swears used throughout would have been better than having to keep track of four or five other non-swears that all basically mean the same thing. The second half of The Maze Runner is a bit better than the first half. But not better enough to convince me on whether or not it's a good book. The action sequences flowed nicely, the setting changed, everything got riskier. The sequel, The Scorch Trials, is already out, so you don't need me to tell you that they make it out of The Maze. As a reader, there was nothing outstanding in the first book that compels me to continue on to the second. The characters were flat, the maze gets solved, no questions are answered, and no new questions are raised. It's just not that great. One thing Dashner has going for him is that he has a ton of other books out, so it might just be his style I'm not grooving on. People obviously like him and his other books, and tons of people liked The Maze Runner. Sadly, I'm not among them. I must admit that I’m new to the YA novel/teen fiction genre. I’ve only read about 6 or 7 YA’s in the past three months. But of that small, limited sampling I haven’t come across many F-bombs. Maybe I’m just getting YA novels from the squeaky clean section. Here I can name a few:my sister’s keeper has quite a number of swearing including F, a lot of Sarah dessen’s books (which is another popluar teen author) includes a few of those too..btw i thought this was a good book….though not as good as the hunger games!